"What are you gonna do, whack me? Like you whacked Connelly? What...what a lie." A sort of New Hampshire version of Fargo, the little-seen recent flick Live Free or Die bites off a bit more than it can chew. That's not to say it isn't without its charms, as while it doesn't work on all levels, it is slightly effective as a caper film. John "Rugged" Rudgate (Aaron Stanford) is a legend in New Hampshire. It's said that he's a hardened criminal, even a killer, but in reality, Rugged is a worthless, hapless, small-time hood. Things change when he reunites with the daffy Jeff Lagrand (Paul Schneider), looking for a share of his family business. Jeff's sister (Zooey Deschanel) won't stand for any part of Rugged's antics, so John and Jeff take matters into their own hands, wreaking tons of havoc throughout their small New Hampshire town. The premise and myriad of plot twists are promising, but the plot is just too meandering, with hardly anything happening in what is supposed to be a comedy. Other than at the general demeanor of Jeff, I didn't laugh a single time, nor were any of the "shocking" story elements, well, shocking. Paul Schneider channels Will Ferrell's A Night at the Roxbury character at times, but is very funny thanks to his own extremely unique mannerisms. He's shown great potential in sleeper films like All the Real Girls by playing a pretty standard everyman, and his turn here as the na�ve partner-in-crime for the ultimate poser is a star turn. Unfortunately, for Aaron Stanford, Schneider steals nearly every scene he's in, making his Rugged character even less sympathetic than he should be. No one in the rest of the cast really stands out, but it's always nice to see Zooey Deschanel in anything. The story coasts along on auto pilot for the first half hour or so, but then a major twist occurs that makes things a bit more interesting and even realistic. The tension mounts as we follow Rugged and Jeff after they're near the scene of a crime, but the plot jumps around so much that there's never enough time for this suspense to pay off. Given that co-directors/writers Gregg Kavet and Andy Robin used to work on Seinfeld, we don't expect much of them as far as building tension goes, but they don't even hint at the originality crafted weekly on that classic comedy series. In all, this young filmmaking pair delivers an uneven effort that misses far more than it works. Their penchant for throwing familiar music cues into random sequences is more of a distraction than anything, and often brings momentum to a halt. Plus, the score is beyond annoying, often coming across as a desperate attempt to put the film in the road movie genre, where it clearly doesn't belong. Image Transfer Review: Despite an incredibly drab, depressing overall look, the 1.78:1 anamorphic widescreen presentation exhibits very few flaws. There's a bit of grain and dirt, but the images are mostly sharp and detailed. The murky look translates to the color scheme, as well, but bleeding and blemishes are avoided. Audio Transfer Review: The Dolby Digital 5.1 track does a nice job with channel separation, but the mix is sorely lacking in overall punch. The music simply isn't loud enough, and often drowned out by what little action occurs. Other elements are fine, but this is a film that relies mostly on dialogue, which is always crisp. Extras Review: A surprisingly healthy collection of extras begins with a commentary featuring Gregg Kavet, Andy Robin, Aaron Stanford, and Paul Schneider. This quartet talks about some of the production's specifics, but spend most of their time joking amongst themselves, which gets old fast. There's also an alternate ending that's definitely more interesting than the actual one, in that it gives us a look at Jeff's life five years down the road. A pair of deleted scenes are also available, but offer nothing in the way of plot development. 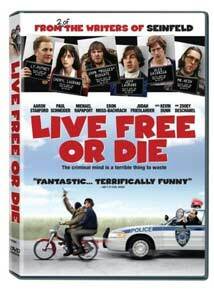 The blooper reel is much funnier than anything in the movie, and we also get the theatrical trailer for Live Free or Die, as well as trailers for other releases. Awful title aside, Live Free or Die looks rather promising on paper, but has a difficult time drawing the audience in to its broad storyline. Also, despite the best efforts of Paul Schneider, the rest of the cast can't rise above mediocrity to help the film. Still, TH!NKFilm delivers the goods with their DVD, complete with above average audio and video and a handful of interesting extras.